← Who knew that …. West Point and Fort Washington in the spotlight! Rochambeau researcher on the trail again for DAR history at West Point! The revolutionary woman I am researching today helped pave the way for Rochambeau’s coming to America. How I love the thrill of the chase! I should be dressed in Sherlock Holmes hat and carrying my lighted magnifier! 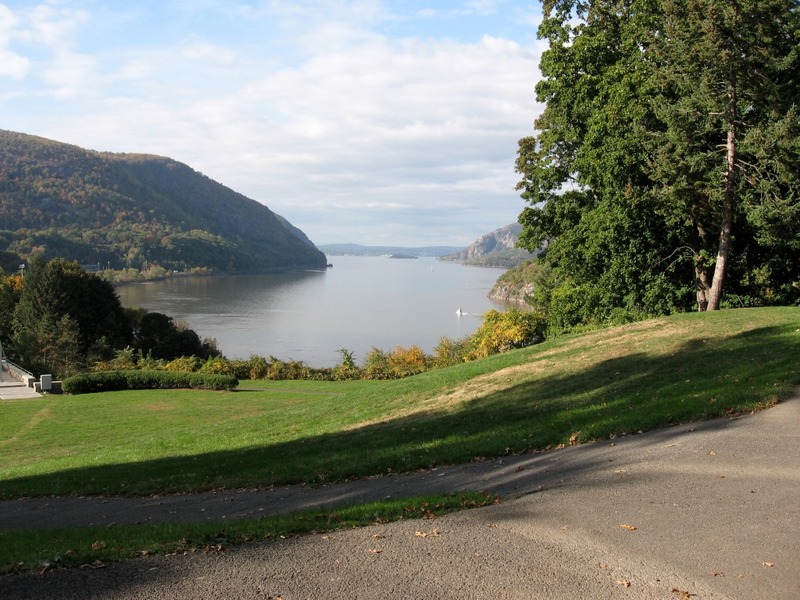 I could hardly wait to step onto the grounds of the illustrious West Point Military Academy. When this destination finally rose to the top of my bucket list last fall, I got out my pad and pen, snatched up my camera and herded my Sherpa into the car of staunch friends to make our way across the mighty Hudson to the Point! My objective was two-fold. First to view for myself the bends in the river that slowed down the British ships and all ships for that matter, early in the Rev. War. (see my photo above) The hope was to bring the ships into range of rebel artillery fire. As I wrote in my book, Washington and his men decided to impede this passage of enemy ships by installing an enormous, most heavy, chain from shore to shore near West Point to stop the Brits from controlling the all important passageway north to Canada and south to the great port of New York. Now for the piece de resistance. The second of my objectives was to find the grave of American patriot, Margaret Corbin, at West Point (see my photo above), camp follower early in the Rev War. I was hot on her trail, having been steered here by research for my talk titled: Four Women in the Time of Rochambeau: A Queen, A Countess. A Future First Lady, and A Camp Follower. Margaret falls into the last category. Most camp followers remain anonymous, but not Margaret, thanks to the DAR. In my study of Margaret, I found she rendered a great service to her fledgling country of the United States of America. In fact she devoted her life to the cause of our freedom! Yours and mine!! Yes!! She followed her husband, John, First Company Pennsylvania Artillery, into battle at Fort Washington, New York City, November 16, 1776. It was a losing battle for General Washington, much to his chagrin and even more so for Margaret who lost her beloved husband as he worked at his cannon that fateful day. Fatally injured, he expired at her feet. Brave, devoted Margaret did not miss a beat but stepped up to the cannon to continue firing on the overwhelming enemy, only to be grievously wounded in her arm, chest and jaw, then sent to a British prison in Philadelphia. Later she was released. Three years later Margaret was compensated by Congress as the first woman to receive a military pension. Her payment was half of the monthly pay of a Continental soldier plus the cash equivalent of a new “set of clothes”. All this was in compensation for her exemplary service and bravery. After a difficult life and constant pain from her injuries, she died in 1800 and was buried in Highland Falls, NY, just south of West Point. Margaret’s story does not end here. 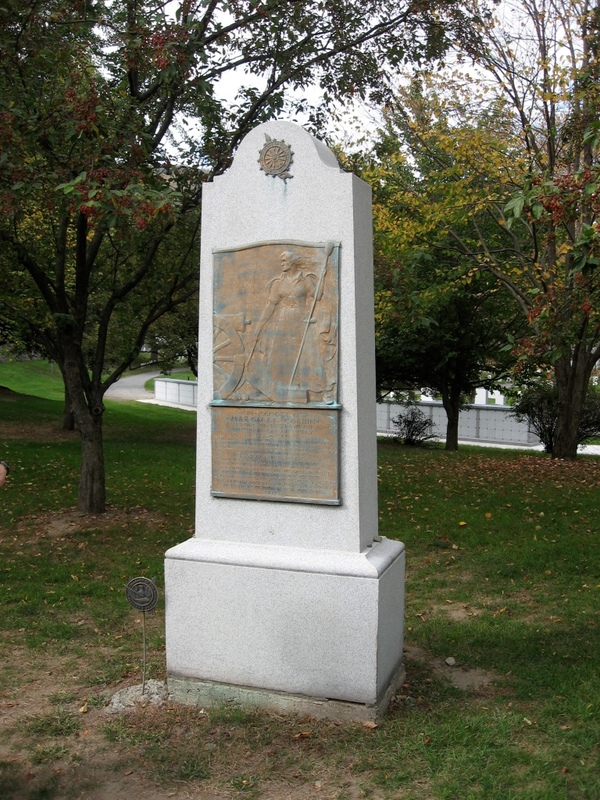 In 1928 that the Daughters of the American Revolution, in recognition of Margaret’s role in the American Revolution, had her remains exhumed and re-buried at West Point. They erected this beautiful monument in her honor. My small group of four followed the tour guide on foot through the West Point cemetery amidst fallen leaves looking for her marker. Then, we rounded a corner on the footpath, walked under a large tree and finally saw it. Unlike the small white marble grave markers of the many soldiers buried at West point, her monument was a surprise to me. I had to look up to see the top of her monument! At the pinnacle of the impressive, nearly-white, granite slab is the DAR symbol in bronze. Under it is the large bronze bas-relief tablet embossed with nearly life-size portrait of Margaret at her station by her husband’s cannon. Now, I am humbly equipped to tell her story, proud of my DAR sisters’ high regard of Margaret’s contribution to the birthing of our nation. Let us remember Margaret Corbin today. you discuss and would love to have you share some stories/information. I know my viewers would appreciate your work.